Wash with a little bit of sunshine every day with this golden sweet smelling soap. Customers will love this bright sunshine soap. With only three ingredients, this soap is very easy to make, and contains an uplifting blend of scents including juicy mandarin, white peach and tropical mango. You Save $0.81 by purchasing this kit rather than buying the items separately. COMMENTS: This is a wonderful smelling soap, I couldn't stop smelling it! As a newbie in the M&P world, this kit was very easy to use. 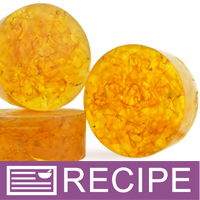 The calendula give this soap a beautiful gold color. A must have ! COMMENTS: Love this soap kit smells wonderful. COMMENTS: I ordered this kit for my friend who wants to try the handmade soap. I invited two friends over my place for soap making trial. Not only my friends were delighted with this soap and I was also very pleased. It smells so nice and the look also very good. I also included one soap into a gift bag for my friend's birthday and she and her daughter was so delighted! I would make more for the fundraising sale for my church. COMMENTS: This was my first MP experience and I loved it. My finished product smells and looks amazing. The instructions with the kits are perfect. And I have some left over product that I can experiment with. Def buying this kit again! COMMENTS: This kit is great! Everything was easy to prepare and follow, but what I love the most is the smell! They look really cool too, but the smell has me running to wash my hands every chance I get. You also get a nice lather with this as well. COMMENTS: I love the smell and color of these soaps. COMMENTS: This was my very first kit in the artistry of soap making and I feel like a pro. First the kit, it's complete and the recipe was very easy to follow. It took me about 25 minutes from start to finish to make soap and I was very impressed on how easy this was. Now I am hooked on this site and the choice of products to make. I have since purchased lip balm, more products and more essential oils. Hopefully I will be able to create my own scents and start my own business. Wish me luck !! COMMENTS: This kit smelled wonderful. It was easy to make and I had supplies left over. COMMENTS: Bought 4 of this kit during the inventory sale because of the reviews I've read on WSP. Well, I gotta say I'm loving this kit. Very easy to make, only 3 ingredients needed, very nice outcome. And the Calypso Sun scent is not overpowering. Never had a headache with this scent. This is definitely a keeper. "There is only one problem with this soap!" • I like everything about this soap! • Make this a larger kit for more soap! COMMENTS: I had a lot of fun making this kit. It was my first Melt and Pour soap attempt. I gave a few as gifts and everyone loved it! Will definitely make again. I like the calypso sun fragrance that came with it. It was delicate and not over powering, just enough scent suggested to use. Also the Calendula petals in the kit add a little something to the bar of soap. It's kind of a like a gentle exfoliater. I like the kit! COMMENTS: This was my first bar kit from WSP and I'm hooked. I loved the ingredients and the finished product. There is plenty of fragrance and calendula petals for another project set too. The final bars are nice, solid, lovely smelling soap. I really liked how the botanicals blended in the clear m&p too! "Fragrant and light exfoliation! Golden bar of sun." COMMENTS: This was another of my early purchases. I loved making the simple recipe of melt and pour soap and what fun it was to see the color change from clear to golden when I added the calendula petals! The fragrance, Calypso Sun, is such a treat of fresh fruit and floral notes that my 20 year old grandson says it is his very favorite. The petals offer light exfoliation for his acne prone back and upper arms and he feels that using this soap has helped improve the pores in those areas. It's not often I get a thumbs up from my older grandsons, so I'm sure glad I tried this kit. I will definitely be buying a replacement kit. COMMENTS: This kit made my "soap debut" amazing. Everything went well and easy. I made these for a vendor show but now I am one bar short because my husband ran off with one he loved it so much. I have a little of the soap left over poured and set aside to "test" it....well that was all she wrote. The lather was fabulous which caught me off guard. I wasn't expecting that good of a lather. Will make again really soon, oh and the Calypso scent...fantastic! COMMENTS: I thoroughly enjoyed making these bars. My customers love them and comment on how rich the lather is and also how fragrant they are. They look beautiful. I will definitely be ordering more of these!! "Everything you need and more!" COMMENTS: This kit comes with enough soap for one batch (6 - 5oz. round bars). Take my advice, buy extra soap. =) As usual, WSP is very generous with the supplies so after making this kit, I still have a TON of fragrance and Calendula Petals left over for many more batches! Instructions are clear, the Calypso Sun fragrance is just as golden and sunny as the looks of the bar, and since Calendula Petals don't brown in soap, there is no need for extra color--However!! If you want these bars to REALLY glow, add a bot of 24 Carat Gold Mica Powder and see them sparkle! I have some great ideas for more and slightly different projects I can make with the excess petals and fragrance! Wish I could send pictures!! Thanks WSP for another winner! COMMENTS: This kit was very easy. The mold is wonderful. I love the petals and am very excited to try them again. I liked how they suspend throughout the soap. I was also pleased with the soap's lather. I thought it would be less because it is DF but I was very happy at the creamy lather from this. The scent is uplifting and my husband likes it so that is great for both men and women. This is a great kit to get started in and you have leftover ingredients to make more or experiment with. COMMENTS: I really enjoyed using this kit. I did my own thing with it, but I loved that I still had fragrance left and lots of calendula petals for other projects. Keep this around WSP! COMMENTS: This soap smells so fine! My customers love that it has no dye, artificial color in it, just the flower petals for color. And then they can hardly resist the sunkissed fragrance. This soap is a winner. • Don't change a thing! COMMENTS: I can't speak much to the M&P part of this kit. I ordered it because I had a coupon, and fell in LOVE with the Calypso Sun scent. It is truly amazing. I put it in CP soap, and it's so FRESH. I just love it. The Calendula petals were lovely as well. I have them infusing some OO right now. "I made this according to the directions but over about 2 months, the bars have turned deep brown. Is there something I did wrong or some explanation for this?" Staff Answer The fragrance does not contain vanilla so we are not sure why this happened. It is possible the calendula turned brown but we have never experienced this nor have other customers. "Could you suggest what size cello bags I would need to package these? Or any better suggestions you had for packaging thank you in advance this is next on my wish list!!" Staff Answer These soaps measure 3" x 3" x 1.25". The best recommendation for Premium Cello Bags is our 3.5" x 2" x 7.5" bags. You could also try our 6" x 6" shrink wrap bags. "Because of the calendula, does this product offer any anti-inflammatory properties? " Staff Answer Thank you for your question. While calendula is known to have anti-inflammatory properties we cannot make that claim about this soap kit.